This is the time of year when you may find yourself driving more frequently or for longer periods of time in order to attend family gatherings and to fulfill the desire to spend quality time around the holidays. Wearing your seat belt is required by law, every time you go somewhere in a vehicle no matter where you are in the country. Boston automobile accident attorneys want to remind drivers that the use of seat belts could save a life this holiday season. Massachusetts law requires any person age 13 and over riding in a personal vehicle weighing less than 18,000 pounds must wear a seat belt. Violators of the seat belt law over the age of 16 will be fined. A fine of $25 is handed out to each person in the vehicle not wearing a seat belt. If someone between the ages of 12-15 is not buckled up then the driver will incur an additional $25 fine. An officer can only enforce these fines if another driving violation occurred to pull the driver over. 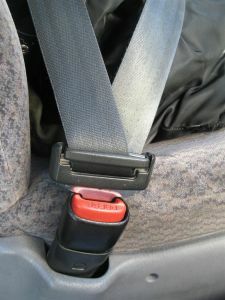 Research has supported that seat belt neglect and penalties associated with violations has actually aided in encouraging occupants to wear their seat belts. According to a recent report by the National Highway Traffic Safety Administration increasing fines and making the seat belt requirement a primary offense makes it 10-12 percent more likely passengers will wear their seat belt in a vehicle. It also seems as though the stiffer the states fine is the likelihood of following the law increases by 3-4 percent. The average penalty in the United States is $25 for violating the seat belt law but states whose fines are $100 have shown an increase of 6-7 percent more people wearing their seat belt. Massachusetts considers the seat belt law a secondary offense but if they raised the fine to more than $25 the state would like see an increase in the number of people who wear their seat belt in the vehicle at all times. Drivers may think if they are running down to the local strip mall they don’t need to wear a seat belt for such a quick trip. Not the case, as so many accidents happen when you are within 5 miles of your home. If you find yourself spending extra time in the vehicle the next few weeks, make sure you buckle up. Don’t put your vehicle in gear until you have checked everyone’s seat belt is fastened and secured. If you have been injured in a Massachusetts traffic accident, contact Boston Car Accident Attorney Jeffrey S. Glassman for a free and confidential appointment to discuss your rights. Call 877-617-5333.